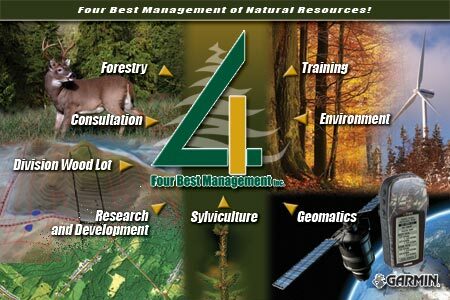 Four Best Management Inc. is a forestry firm who offers superior quality services for high-quality management pratices. Working in partnership with many customers, our firm offers complete services in different sectors. Four Best Management operates in nine (9) different sectors: Research and Development, Forestry, Geomatics, Training, Silviculture, Environment, Wood Lot, Consultation and Private Sale. Our company is based in Northwestern New Brunswick. Our mission is to improve sustainable management practices of natural resources for our clients and partners.